A collaboration between visual artists Alan Counihan (collaborating with fellow artist Gypsy Ray), Johnswell National School and Barnstorm’s Outreach came to fruition with a presentation called The Spooky Feast in the Scary Field, performed on the 24th June 2010, St John’s Day, in Johnswell Community Hall. Barnstorm’s Outreach was invited to collaborate with visual artist Alan Counihan, along with Johnswell National School, for the drama element of the artist’s The Townlands Project; a community-based creative exploration of the nine townlands of the old civil parish of Rathcoole, in collaboration with his fellow artist Gypsy Ray. Townlands is supported by the Heritage Forum of Kilkenny County Council. The challenge of transposing an artist’s concepts into theatrical tangibles is an exciting and inspiring process. 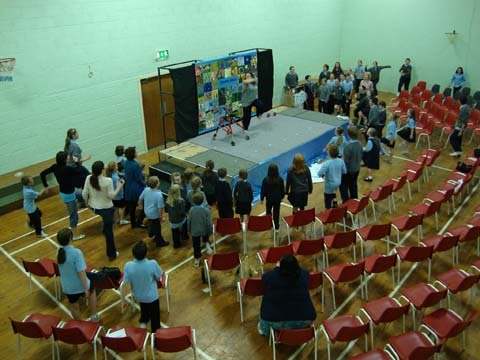 Barnstorm worked with the pupils of Johnswell National School to create a theatrical piece based on Alan’s aim to connect the local people to their local landscape. Johnswell is a small village nine miles from Kilkenny city. The national school has fifty nine pupils, in three class groupings. All the pupils were involved in this project. The pupils worked in their existing class groupings. Overall there were 30 contact hours with additional time given to preparation and planning. The support, approach and commitment of the teachers, principal Anne Holohan, and pupils were invaluable to the success of the project. The overall aim of the drama element of Townlands was represention of local place to, and by local people. To achieve this each class group worked in a different way. In the spring of 2010 exploratory work began on this collaboration. Alan Counihan provided what was to be invaluable research that shaped the work with the pupils, namely the field names of the area, and stories which had been collected from pupils of the same school involved in a heritage project in 1937-38 (the Béaloideas/ Irish Folklore Commission’s Schools’ Initiative). The process started with an open workshop with the school’s three class groups to assess needs and capabilities. The devising process happened over 5 sessions, followed by shaping and rehearsals of the performance. The time-scale was short; each group had between 2½ and 4 hours to devise. The remainder of the time was to give the pupils the confidence in what they were doing so that they would be comfortable in performing their pieces. Whole-school rehearsals took place on the days preceding the performance. 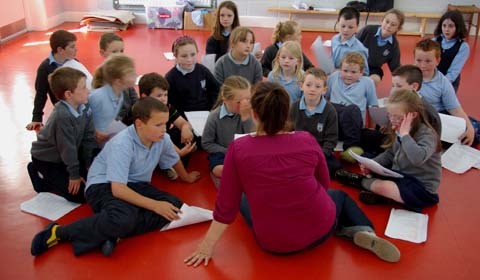 Junior and Senior Infants, the youngest group, worked primarily through movement, visuals and group rhymes. They devised around the idea of seasons and what happens to the land throughout the year. They worked through each season at four consecutive sessions and then put the piece together. The support and knowledge of the teacher and resource teacher for this age group was great. Even the children who were challenged by the rules and rituals of theatre became engaged and all pupils performed with confidence and charm. During the performance the children followed musical and visual clues and prompts. The largest group with the widest age range was the 1st to third class group. 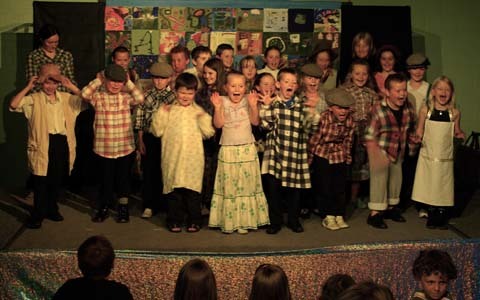 The children worked through stories that had been written by the pupils of Johnwell National School in 1937-38. The children then chose 6 of these stories to share with the audience. The stories were presented in storytelling form with a narrator and characters speaking the lines. Every child took part. Then as a whole group, and to have something of their own to perform, we worked together to create a story based on the recurring themes of the ’37-’38 stories, which they performed as a choral group. Again, the support and willingness to engage from the teacher and resource teacher really enriched the process. The stories provided by Alan engaged and excited the pupils and lead to some interesting conversations about the passing of time and life. The eldest class group, 5th and sixth class, were given the most challenging piece to realise. Alan had collected some four hundred field names through his research and used this as the basis of the work with the senior group. During the process, we explored topics of land and home and what that meant to the children. Although challenging to some of the children, they all stepped up to the mark. This group gave a committed and informed presentation on the day. 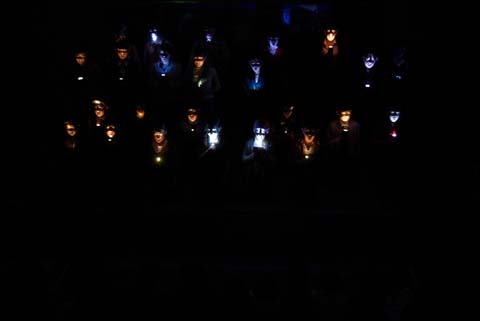 Using speech rhythms they created a performance of the 400 field names, accentuated with individual torch-light. On June 24th, St John’s Day, the collaboration came to fruition with a dramatic presentation, Spooky Feast in the Scary Field performed on in Johnswell Community Hall. There were challenges of the venue which included limited options for stage lighting. The acoustics in the hall were a definite challenge, especially for young performers. All-in-all the performance was a resounding success. The pupils of Johnswell deserved the wonderfully positive feedback and applause in response to their work. In seventy years time, The Spooky Feast in the Scary Field may be the basis of a new work by another generation!